I’ve written previously about my Ground Source Heat Pump (GSHP) and how it would be eligible for the Renewable Heating Incentive (RHI) once launched. Well, after several delays, the RHI was finally launched in early 2014 so I proceeded with making an application. In case you are not aware of the RHI, it’s a UK Government backed subsidy scheme designed to encourage the up-take of renewable energy sourced systems for heating. This includes technologies such as ground and air source heat pumps, biomass boilers and solar thermal panels. The RHI scheme is similar to the Feed in Tariff (FiT) scheme already in place for solar PV installations in that you receive a tax free, index linked payment every quarter for a period of 7 years (compared with the 25 year period for solar PV FiT) based on the amount of renewable heat you are generating for yourself. When combined with the solar PV FiT payment, this more than covers the cost of installation of the new technology and also will pay for our only fuel source – electricity – for the next few years. For more information about RHI visit the Ofgem site. One pre-requisite for applying for RHI is that you have had a Green Deal assessment carried out to determine the EPC rating for your property i.e. how energy efficient it is and what measures should be considered to improve it’s rating. 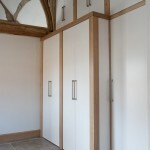 I had already increased the loft insulation to a depth of 300mm in our relatively small loft space, and with the recent barn conversion utilising modern building techniques and materials our energy efficiency was better than it had been over previous years. As a result, our EPC rating came out as C (70) with an estimated total heating and hot water demand of 25,000kWh per year which wasn’t too bad considering it’s an early 19th century barn conversion. However, the biggest delay to being able to make the RHI application was down to the desire to have a heat pump performance assessment carried out in an attempt to secure the highest possible RHI benefit rate. The RHI tariff is based on the amount of renewable heat generated, so this has to take into account the efficiency of the heat pump i.e. the more efficient the heat pump is, the greater the ratio of heat generated to electricity used to generate it (to drive the pumps). This efficiency is called the Seasonal Performance Factor (SPF) and the RHI scheme assumes an SPF of 2.5 for all applications for legacy heat pump installations. Now I was pretty sure my heat pump was more efficient than that so I commissioned Ice Energy, the supplier of the heat pump, to carry out a full assessment. The assessment involved a site visit and survey with lots of measurements of rooms and construction materials taken followed by an office based analysis running the numbers through a spreadsheet. This process took longer than I had hoped and when I finally got the results back, I found that it had been assessed with an SPF of 2.5 – the same as the default! The reason for this was that two radiators in two large open plan connected rooms in the older part of the house were deemed as undersized. So, if I wanted to achieve an SPF of 2.8 I would either have to install additional radiators or replace the existing double panel double convector radiators with larger ones. As space was tight I decided to upgrade these radiators to triple panel triple convector equivalents, a job which I did myself. Once the new radiators had been installed, Ice Energy issued an updated SPF rating of 2.8 which would increase the annual RHI benefit by around £300 – more than paying for the cost of the heat pump assessment and new radiator installation. With the final agreed SPF rating and Green Deal assessment / EPC I could then make the actual RHI application. The application took a few days to go through an approval process, but once completed I was informed that my first quarterly payment of £733 would be made in November 2014, with subsequent index-linked payments being made quarterly for the full 7 years. I love my Ground Source Heat Pump! It’s just over a year now since our IVT Greenline HT+ E11 11kW ground source heat pump (GSHP) was installed so I thought it would be the perfect time to reflect on our experiences of owning and running a system like this, and also importantly to do some quick analysis on how much electricity we’ve used over that period compared with previous years. 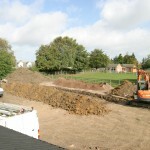 First, though, it’s worth a re-cap on why we decided to install a ground source heat pump in the first place. During the latter part of 2011 we extended our house considerably by converting an adjoining timber-framed thatched barn into additional living space and creating an enlarged entrance hall, a new open plan living and dining space, large kitchen and utility room. Our existing central heating and hot water system was an electrically heated wet system with radiators designed to work with low-rate electricity tariffs. Although electrically powered (which sounds frighteningly expensive! ), this had worked reasonably well and efficiently over the previous 12 years since installation but it was nearing end-of-life, the manufacturer had gone out of business and it was simply not big enough to satisfy the increased demands of the enlarged property. So it had to be replaced with a new system. After looking at all the options available to us, particularly as we are off the gas grid, and comparing various traditional technologies with newer ones, a ground source heat pump emerged as the ideal choice for us. 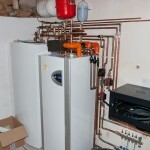 At the time we decided on a GSHP we also planned to add a solar thermal installation to supplement the hot water. As it eventually turned out, we didn’t install solar thermal and instead opted for a 4kW (peak) solar PV array which, we were told, would be a very good companion to the heat pump. Our GSHP system was supplied by ICE Energy, probably the UK’s biggest and most experienced supplier of GSHPs. It was important to me that we chose a company with a lot of experience given the general lack of knowledge and even awareness of this technology, and we definitely got that with ICE Energy. Their sales, engineering and technical support staff were very knowledgeable, efficient and professional at all times so I would highly recommend them to anyone else looking for a heat pump. The installation of the heat pump, cylinder and associated plumbing was pretty straightforward for the plumber working on our barn conversion, even though he had never installed one of these before. The work associated with the installation of the ground collector pipework loops was a lot more than I had originally imagined, with some 300 tonnes of soil being moved during the course of the work: digging the three trenches, 50m long x 1m wide x 1m deep, laying 200m of coiled collector pipe “slinkies” in each trench, creating a concrete inspection chamber to house the pipework manifolds, filling the trenches back in and making good the paddock again. Having said that, it was all completed within about 4 days and even though my paddock looked like a barren wasteland for a few weeks, it didn’t take long for the re-seeded grass to grow back and look as good as it had previously. The commissioning of the system, which included checking the basic installation, filling the collector ground loop with the heat transfer fluid and powering on the system for the first time was carried out by an ICE Energy engineer. He also talked through the basic operation of the system, how to tweak the controls and what maintenance tasks needed to be performed. There was a lot of information to take in but I also had the full manual which I read several times to make sure I absorbed the important detail. Initial impressions of the system were very favourable. 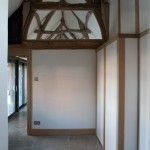 It was very quiet in operation, which was an important factor given that it is housed in specially made oak framed cupboards in our entrance hall, immediately adjacent to our main living area. The first few months involved a lot of tweaking of the system settings in order to find an acceptable level of comfort while still trying to keep it running as economically as possible. The primary settings of the heat pump include a heat “curve” which dictates how much heat the heat pump should generate given the current outdoor temperature and the temperature of the water returning from the underfloor/radiators. The steeper the curve, the more heat it will generate at lower temperatures. There is also a “fine tune” setting which raises or lowers the heat curve (not adjusting the slope of the curve) to increase or decrease the target temperature. One other setting I tweaked was that of the domestic hot water temperature, which was initially set to 49°C. I lowered this to 47°C which was still perfectly acceptable for hot water but would squeeze a little bit more efficiency out of the system by not being required to maintain quite as high a temperature. The installation has been problem free apart from one occasion during the first couple of weeks after installation where our new underfloor heating wasn’t reaching the desired temperature, and this turned out to be because the pressure in the unvented system had dropped. Once this was corrected we had no further problems like that. It’s fair to say that the house, particularly in the old part with traditional radiators, was cooler than it had been previously during this initial running-in period but we eventually found the settings that worked for us under all conditions and we’ve not changed them since. In fact, that is one of the selling points of a system like this – once it is set up, you shouldn’t ever need to touch it again! There is virtually no maintenance to be carried out on the GSHP and I believe this is true for the whole life of the system. You do have to check a couple of particle strainer filters a couple of times a year, one external to the heat pump unit on the ground loop circuit, and one internal to the unit. This is a straightforward task and should only take around 30 mins at most to complete. 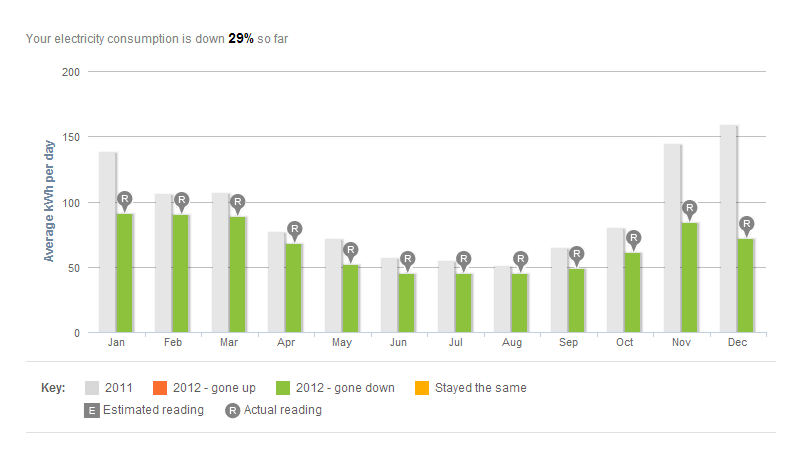 So, we finally get onto our electricity consumption over the last year. Bearing in mind the house is now almost twice as big as it was previously with a larger space to heat and more appliances and lighting, I’m very happy to report that our electricity consumption has actually gone down over the last year by around 30%! I’ve got to say I am very pleasantly surprised by this and I had feared quite a few times that we would be using more electricity. Our solar PV system will have had some impact on these figures due to the fact we will have used our own generated electricity some of the time rather than having to import it. But this is probably not a significant factor as the times when we were generating the most electricity were a few hours during sunny Spring and Summer days when the heat pump wasn’t on much. Looking at seasonable usage, I suspect the savings are largely down to the efficiency of the GSHP when compared with our previous system. I haven’t had chance to calculate the coefficient of performance (CoP) for our system yet but this is something I would like to do in the future. Don’t get me wrong – we still use a lot of electricity, much more than a lot of households use I would imagine – but the important and re-assuring thing is that we are now using considerably less than we did before. And given that our only fuel is electricity, this bodes well for the future. Finally, I just wanted to say a little about the financial aspects of this system. In total, it probably cost us around £15K for the installation of the GSHP, which is quite a sizable up front investment, however this was offset slightly by a £1,250 installation grant under the Renewable Heat Premium Payment (RHPP) scheme operated by the UK Government. 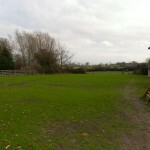 In addition to this, if all goes to plan, the new Renewable Heat Incentive (RHI) scheme should start in Summer 2013 which will provide an annual payment towards the cost of the installation, similar to the Feed-in-Tariff (FiT) scheme for Solar PV installations, over a proposed 7 year period (compared with the 20+ years for solar). This would more than cover the cost of installation of the GSHP system, and when combined with the solar FiT payments we are already receiving, will cover the cost of all of our energy usage over the next few years. So… we’ve been living with our IVT Greenline HT+ E11 11kW ground source heat pump for another week or so now and I happy to report that it’s still performing admirably. The outside temperature is just below 0°C and the house is nice and warm, with the new part of the house with underfloor heating at around 20°C. The glycol based heat transfer fluid which collects heat from the ground is currently entering the heat pump at 1.3°C and after heat has been extracted from it, it is being returned to the ground loop at -1.9°C. We currently have the hot water temperature set to 48°C but I’m going to try lowering that to 47°C in an effort to squeeze a bit more efficiency out of the system for no noticeable impact. I’m also watching the electricity meter and compressor operating times like a hawk but so far my gut feel is that we’re using less electricity than we were over a similar period of cold weather last year. The heat pump throws a wobbler! That was until the underfloor heating simply refused to get warm a couple of days ago! The target temperature being shown by the heat pump for the underfloor circuit looked perfectly reasonable yet the actual temperature reading from the sensor next to the shunt / mixer valve controlling the underfloor supply was way too low. And it simply refused to get anywhere near the target temperature despite regardless of any settings changes I made. After previously thinking I’d got the heat pump operation and control completely sussed, this was a bit of a let down. After speaking with the excellent technical support team at ICE Energy they decided it would be best if an engineer came out to check the shunt valve, so an appointment was booked. Shortly afterwards I just happened to be looking over the heat pump installation and I noticed that the pressure gauge for the unvented system had dropped from the normal of around 2 bar to just over 0.25 bar. This wasn’t right so I corrected it and lo and behold, the temperature of the underfloor circuit started to rise! I called ICE Energy back and explained what I had found and they told me that an air lock or low pressure would cause the symptoms I’d been experiencing, which was reassuring. So fingers crossed, that little hiccup is fixed now. And, as equally important I am back to being confident I know how the system works again! 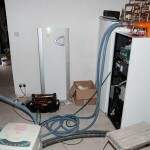 Our ground source heat pump is now alive! After several months of research, product sourcing, price negotiation, grant and subsidy research, extensive groundworks and final installation, I am very pleased to announce that our ground source heat pump has now been commissioned and is up and running providing heating and domestic hot water for the whole house! All of this was carried out by Ben, a very knowledgeable and competent engineer from ICE Energy and after all the steps were completed the heat pump was powered up and it got up to speed in no time at all. The first thing I was relieved to notice was that the heat pump is very quiet. As it is situated in the new enlarged hallway next to the new family room I was praying that it wouldn’t be too loud so as to be noticeable. I had previously been told that it would not sound any louder than a typical fridge but I was still slightly apprehensive given it’s position in the house. However I’m happy to say that it is absolutely fine from a noise perspective. Additionally, it will be enclosed in a purpose built cupboard with the potential for further internal soundproofing so noise will not be an issue. The second thing I noticed was how quickly it got up to speed heating up both the new underfloor heating and existing radiators in next to no time. One minor worry we’d had in our minds throughout the installation of this system was whether it would provide sufficient heat for the radiators in the existing part of the house (2/3 of the total house split over 2 floors). As the temperature of the water output from the heat pump is lower than that from other hot water boilers typically used with radiators, we’d been told that the radiators would never get as hot as previously, feeling only lukewarm to the touch. 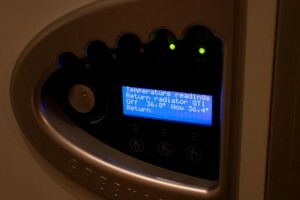 However, since the heat pump was switched on the radiators have felt no cooler than before which was quite a surprise! 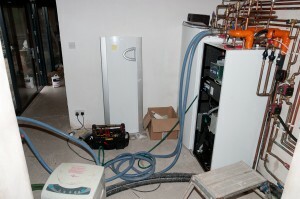 The control system for the heat pump is very different to controls found on traditional heating systems, with numerous temperature sensors monitoring the outdoor and indoor temperatures, flow and return temperatures for the ground loop heat transfer fluid, radiators and underfloor heating and using these in combination with various heat curve settings in order to determine how much heat is required from the pump. The wealth of control settings is quite overwhelming but apparently once the system is established we should hardly, if ever, need to adjust these settings. Overall, I’d say the house has been hotter than we expected since the heat pump took over from the old system, which is reassuring given our initial concerns about how it would cope with so many radiators. Although the heat pump was configured with an initial range of settings I’m sure there will be lots of tweaking (in consultation with ICE Energy’s excellent technical support line) over the next few weeks until we get to a point where we are comfortable with everything. Following on from my previous post about the work starting on the installation of the ground loop for our ground source heat pump system, here are a few more timelapse videos of the groundworks. Now that the work is almost complete, one comment I will make is that the scale of the work involved is much bigger than I had originally expected. 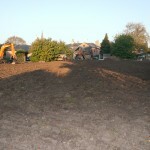 I knew the numbers involved – 150m of trench in total, 1m wide by 1m deep, 60 tonnes of sand etc. 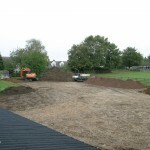 – but until you actually see how much soil is moved and effort involved, you don’t appreciate the scale of it. Having said that, the guys doing the work have been very efficient and the paddock is well on its way to being back to its state before, minus the grass of course which will have to be grown from seed again once the work is complete. 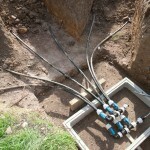 The ground source heat pump ground loop gets installed! If you’ve read any of my previous posts, you’ll know that we’re installing a ground source heat pump as part of our barn conversion. Well, the installation of the ground loop collector pipes started in the last couple of days and I siezed the opportunity to shoot some short timelapse videos of the work being done. The videos linked below show how the 50m x 1m x 1m trenches are dug and how the 200m of pipe loop in each trench is laid as 1m diameter coiled “slinkies” on a bed of 100mm sand. The videos are only short (they were shot with a 15 second interval between each timelapse frame) but are HD so make sure to select the 720p HD option on playback. Over the last few months I’ve been researching and planning a reasonably large building project to convert a thatched barn adjoining my house into additional living space. This new living space will obviously require space heating and domestic hot water (DHW) and so part of the project research has been concerned with investigating and choosing the system to be used. Our current heating and DHW system is based around electrically heated water driving a traditional wet radiator distribution system. Although powered by electricity, this system has operated relatively efficiently over the last 12 years due to it using a special low rate tariff for the majority of the time. However, this is a bespoke system produced by a company that went out of business several years ago so knowledge and spare parts are pretty scarce, and this coupled with the fact that it would not be large enough to satisfy the requirements of the new complete house means that continuing to use this system would not be viable. 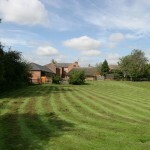 We could choose to continue using the existing system for the old part of the house and install a completely new, separate system for the barn conversion but I feel the right thing to do would be to install a completely new system to cover the whole house, old and new. Scared by the thought of ever increasing fuel costs, the idea of a green / renewable energy based system started to appeal more and more. When also taking into account the generous benefits of the Renewable Heating Premium Payment (RHPP) and Renewable Heating Incentive (RHI) schemes (more on this later), it starts to sound even more attractive. The ground below us stores energy from the sun as heat and from a depth of around 1m below the surface the temperature remains pretty constant all year round (between around 7°C to 13°C in the UK). 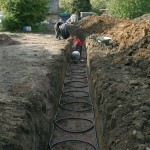 It is possible to extract some of this heat energy using liquid filled collector pipes buried in the ground. The liquid is pumped through the pipes and this warms up as the heat from the ground is transferred to the liquid. Only a few degrees difference in temperature between the flow and return is enough to drive a heat pump unit which can be simplistically described as a refrigerator in reverse! 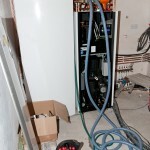 It uses a system of compressors, condensers and heat exchangers to convert the small temperature differentials in the liquid coming from and going to the ground collector pipes (low grade heat) into hot water which can be used for space heating and domestic hot water (high grade heat). Once the heat energy has been extracted from the collector pipe liquid, the cooler liquid is pumped back into the ground collector pipes for the whole process to be repeated. So, the only “fuel” used in this system is the solar energy extracted from the ground (which is free to us!) and the electricity used to drive the heat pump system. For a system sized correctly and operating efficiently you can expect it to be 400% efficient, that is for every one unit of electricity used to power the system you will get four units of heat energy out of it. Sounds good, doesn’t it! 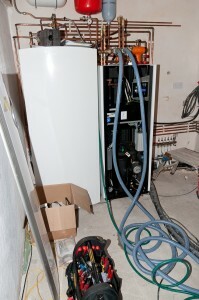 The heat pump can generate hot water for both heating and DHW. It works best driving underfloor heating due to the lower maximum temperature of the hot water it produces (up to 65°C) when compared with traditional carbon fuel based water heaters. 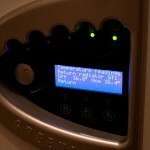 However, it can drive radiator based distribution systems albeit at a lower temperature than traditional installations. 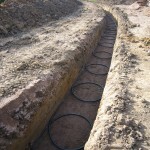 The most common approach is to use horizontal trenches of either straight pipe loops, where enough land is available, or slinkies where there is less available space. In our situation, the most cost effective and suitable option is to use slinkies. Having decided that a GSHP was the technology to go for the next decision was to find a supplier and installer. I was very keen to find a company who had significant experience of this technology, a good reputation and good levels of support as it is vital that the system is sized and installed correctly for it to operate efficiently. The company would also have to be MCS (Microgeneration Certification Scheme) accredited in order for the installation to qualify for the various government grants available. After a lot of research I decided to go with ICE Energy given their excellent reputation and long history of supplying and installing GSHP systems. My ICE Energy sales contact Richard Floyd was very knowledgeable and helpful throughout the whole process and provided answers to my many (and there were a lot!) and varied questions. After an initial assessment of the requirements, including details of the property, it’s construction, levels of insulation, number of rooms, ratio of space heated by radiators to that to be heated by underfloor heating, land available for ground collector pipes etc. Richard produced a specification for a system comprising an 11kW IVT Greenline HT+ E11 heat pump, 600m of ground collector pipe installed as 3 x 50m trenches of slinkies and an IVT STS280 280 litre cylinder with solar coil. A further site survey was carried out shortly afterwards by a very knowledgeable and friendly engineer Adrian Rawle to ensure that the initial system specification was suitable and appropriate, and to finalise any fine detail specific to my particular installation. ICE Energy are responsible for the specification of the system, the supply of all components, unlimited technical support during installation and final commissioning of the system once installation is complete. The actual installation of the ground collector pipes will be carried out by my main building contractor responsible for the barn conversion and the installation of the heat pump, cylinder and associated plumbing and electrics will be carried out by the plumbing and electrical sub-contractors working on the barn conversion. It’s worth saying something about the government grants associated with the installation of renewable heating systems as it was a big factor taken into consideration when determining what system and technology to go for. The UK government has made a big commitment to green and renewable energy and one aspect of this is encouraging the take-up of such technologies in the commercial and domestic sectors. For domestic installations this translates into providing two grant and subsidy schemes known as the Renewable Heat Premium Payments (RHPP) and the Renewable Heat Incentive (RHI). RHPP is a short term scheme (scheduled to finish in April 2012) which provides a grant towards the installation of qualifying renewable heating systems. 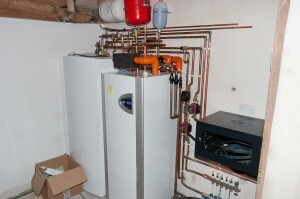 Ground source heat pumps are a qualifying technology which attracts a grant of £1,250. More interestingly, RHI is a longer term scheme scheduled to start in October 2012 which will result in guaranteed index linked payments for a period of 23 years (in the case of GSHP installations) based on the amount of heat energy a qualifying system is generating. The final tariffs have yet to be determined but the estimate at this time is that our particular installation would attract payments of between £1,500 – £2,000 a year! The barn conversion has already started (look out for details of progress in other blog posts) so at some point in the next few weeks the work will start to install the ground loop collector pipes in the paddock. 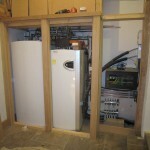 I’ve just bought a ground source heat pump!